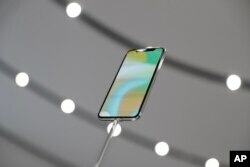 Apple released the latest in smartphone technology Tuesday — the $1,000 iPhone X (the X stands for the number 10, not the letter X) — a gadget Apple calls the new generation of mobile communication. Apple CEO Tim Cook unveiled the new phone at the first event to be staged at the Steve Jobs Theater — named for the late Apple founder who introduced the iPhone 10 years ago. "Ten years later, it is only fitting that we are here in this place, on this day, to reveal a product that will set the path for technology for the next decade," Cook said. Among its many features, the new iPhone can shoot better photographs in low light and has wireless recharging. Perhaps its most unique new feature: The new phone can be unlocked by facial recognition. The new iPhone X is displayed in the showroom after the new product announcement at the Steve Jobs Theater on the new Apple campus in Cupertino, California, Sept. 12, 2017. But the big question is, will consumers hand over $1,000 for a fancy, feature-laden telephone? "Just because you're unhappy with your phone, just because it seems to not be working, doesn't necessarily mean that you absolutely need that shiny new thing," Mark Hamrick, a senior analyst with Bankrate.com, tells VOA. But Hamrick says he believes Apple did a very good job with innovation along with the hardware and software that went into the iPhone X. He says there will always be a market for it, despite the high price tag. "I think, truly, that there are some people out there who will skip meals to have these devices. We can debate whether that's wise or not. ... What we're really talking about is not paying cash for these devices, but looking at the monthly payment," Hamrick said. Apple has sold more than 1.2 billion iPhones since it released its first one in 2007. The company is looking to the iPhone X to revive its sagging market share as other companies grab a piece of the multibillion-dollar industry. Also Tuesday, Apple introduced major upgrades to its TV streaming device and to the Apple Watch, including an ability to detect an elevated heart rate when the user is inactive.